Workplace conflict is inevitable. Everything DiSC® Productive Conflict helps learners improve self-awareness around conflict behaviors. Rather than focus on a step-by-step process for conflict resolution, Everything DiSC® Productive Conflict helps learners curb destructive behaviors so that conflict can become more productive, ultimately improving workplace results and relationships. 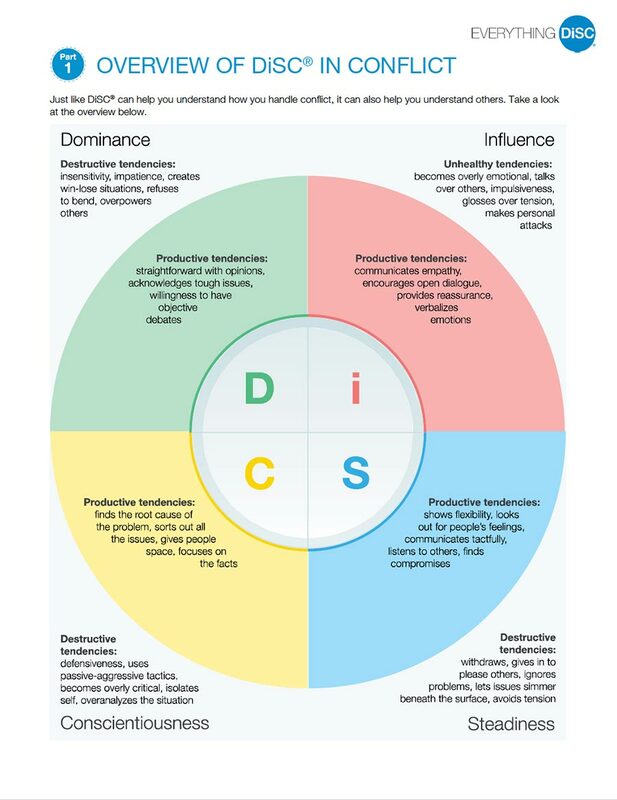 The 22- page Everything DiSC® Productive Conflict Profile provides an in-depth report that highlights techniques to improve self-awareness around conflict behavior. Existing Data: If learners have existing data from a previous DiSC® assessment, that data can be used with the Everything DiSC® Productive Conflict. Your DiSC Style in Conflict: The Profile contains highly personalized information that is specific to a participant's responses to the assessment and to their corresponding DiSC style. Changing Your Response: With strategies to curb destructive responses, learners discover how to step back and reframe productive responses t conflict situations.